To compare serum and aqueous humor (AH) vitamin D levels between the patients with diabetic macular edema (DME) and controls. A total of 65 subjects (30 DME, 35 control) were included. One-third of the control group had hypertension, dyslipidemia, or diabetes mellitus without diabetic retinopathy as underlying diseases. Serum and AH levels of 25-hydroxyvitamin D were measured in each subject. Multiple linear regression analysis was performed to investigate factors associated with serum and AH vitamin D levels. There were no significant differences in serum vitamin D levels between the DME (14.3 ± 9.1 ng/mL) and control (16.2 ± 8.0 ng/mL) groups (P = 0.374). However, eyes with DME (41.6 ± 8.0 ng/mL) had a higher AH level of vitamin D than control eyes (25.5 ± 4.1 ng/mL, P < 0.001). AH vitamin D level was significantly associated with the presence of DME (β = 0.775, P < 0.001). Serum and AH levels of vitamin D were not significantly correlated (r = − 0.157, P = 0.211). Serum vitamin D levels did not significantly differ between the DME and control groups. 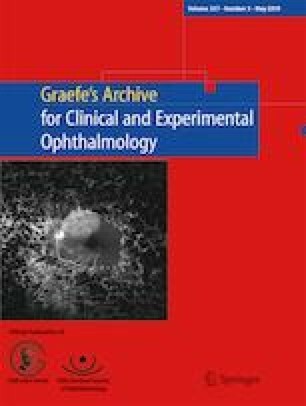 Localized vitamin D level in the eye was independent from systemic vitamin D level and it might be another indicator of DME severity. This research was supported by Hallym University Research Fund 2016 (HURF-2016-59).